No, those aren’t just sticks in the mud! Thanks to Phil in South Seattle, who kindly offered free raspberry canes, and the efforts of Steve and Sophia to acquire and plant the canes while braving the chilly January rain, the Miller Community Center Garden now has its own raspberries! You can also see some of the artwork we added to the beds in 2012. What a long way we have come from an underutilized area along the edge of a park! Stay tuned for more in 2013! Mason Bee Condos	Spring into Action! That’s fantastic! 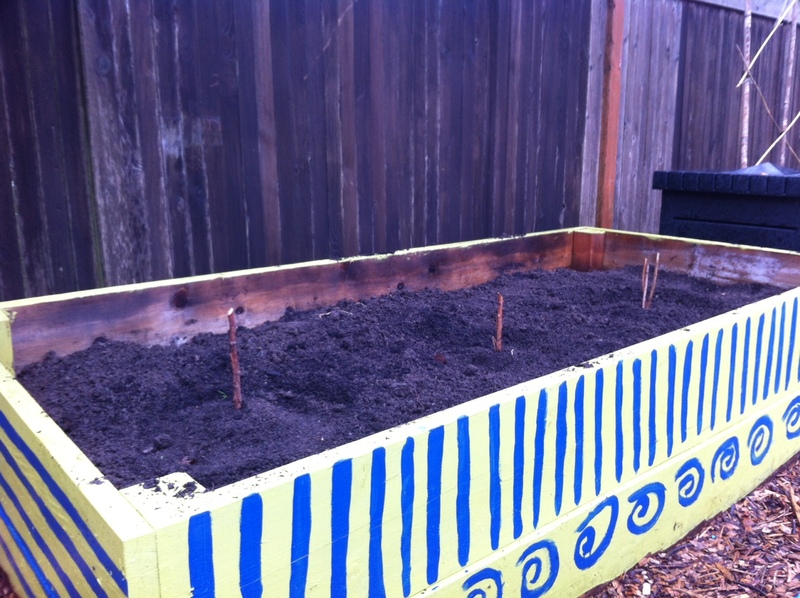 I can’t wait to come see the newly decorated beds and developing raspberry plants the next time I’m in Seattle. I’m so glad you’re keeping the garden’s momentum going!